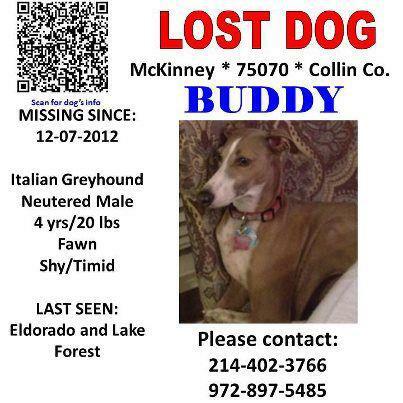 Buddy is an Italian Greyhound lost in Collin County, Texas. He went missing on December 7, 2012 at El Dorado and Lake Forest in McKinney (zip code 75070). He is a neutered male, 4 years old, weighs 20 lbs, with a fawn or tan/white coloring. If you spot him or find him, please contact 214-402-3766 or 972-897-5485 immediately. His family misses him! This entry was posted in ALL, Lost dogs and tagged Italian Greyhound Lost in Collin County, Italian Greyhound Lost in Texas, Lost Italian Greyhound in Texas. Bookmark the permalink.